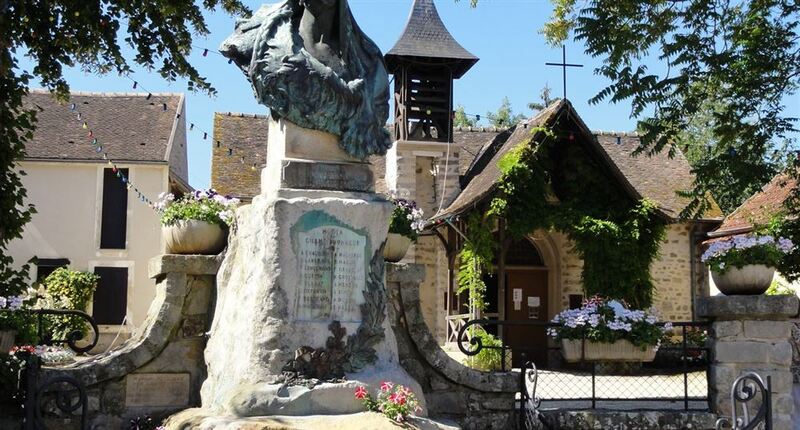 The town of Barbizon, near the forest of Fontainebleau, is a mythical place. Known as the "village of painters", the commune was born the Barbizon school. 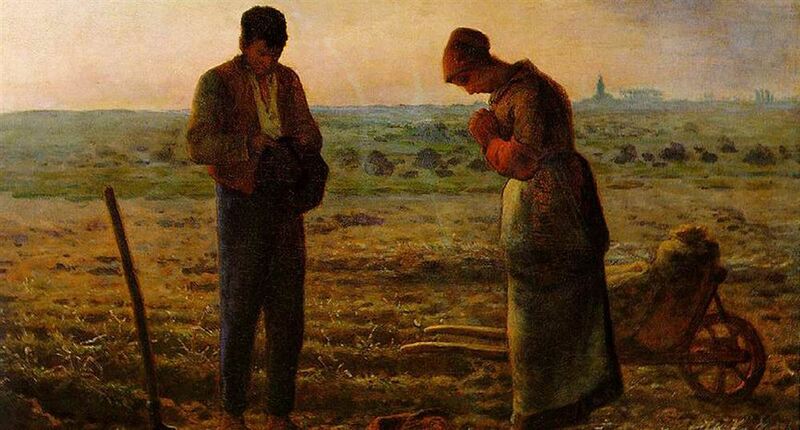 The most illustrious representatives of this school are Théodore Rousseau and Jean-François Millet (the Angelus). 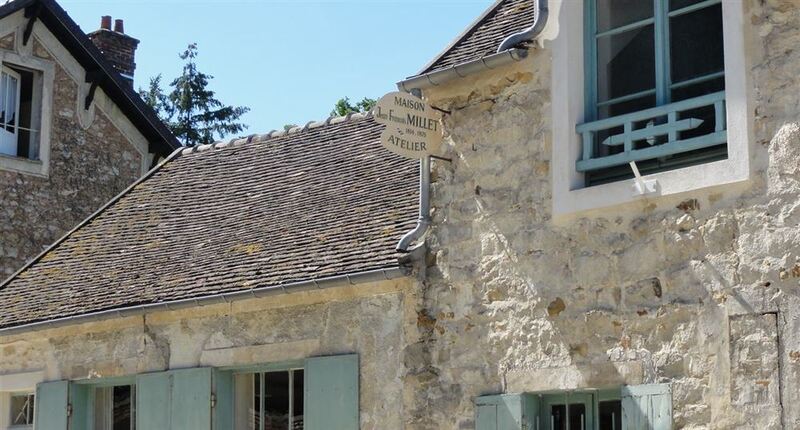 We can also visit the former Studio of the painter the Millet workshop. 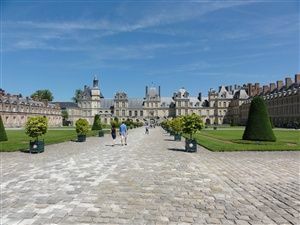 The commune is located 1 hour from Paris, you must come by car. The place is tourism and attracts a crowd of often foreign tourists. 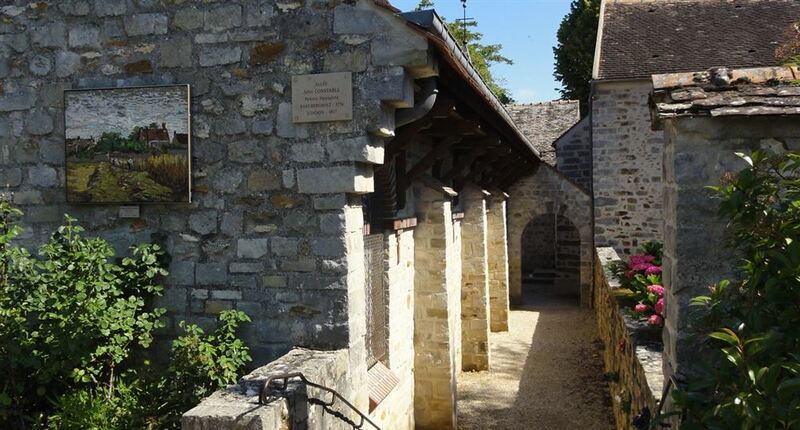 The visit in the high street and in the museums of the city to discover the work of painters in Barbizon. 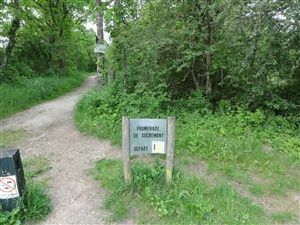 For those wishing to discover the forest of Fontainebleau just go at the end of the village where there are signs indicating the start of the hiking trails. To summarize Barbizon is a great place for a stroll on a Sunday of summer. View of the passage that allows access to the high street. The center of Barbizon is very well restored. 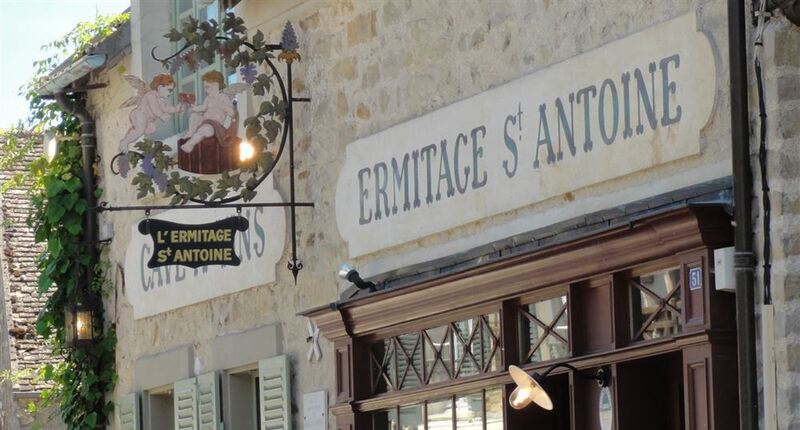 In the high street you can visit the Gannes Inn that hosted visiting artists during the age from 1830 to 1870. the hostel Gannes today houses the Museum of the school of Barbizon, it renders the atmosphere of the time. View of the village. The high street is very touristy in summer. The place is quite chic with a strong foreign presence the price of restaurants is affected. 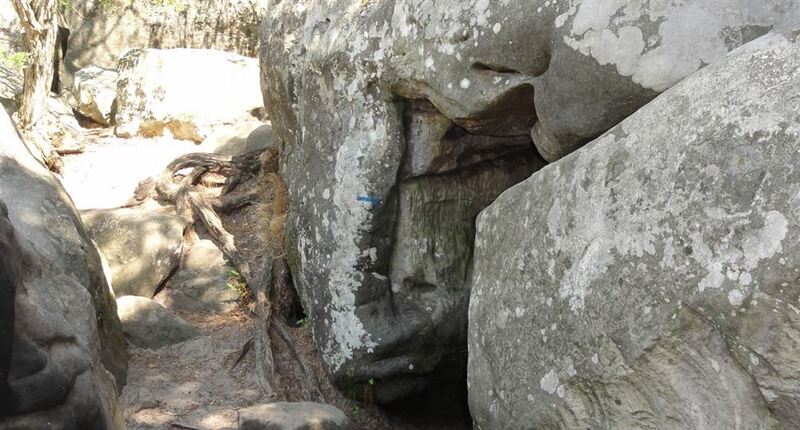 Following the marked route, we can find the Medallion Millet-Rousseau, not far the elephant rock. The location is easy to access. The medallion is a simple engraving in the rock. Nothing exceptional but ideal for a short walk before going to eat. 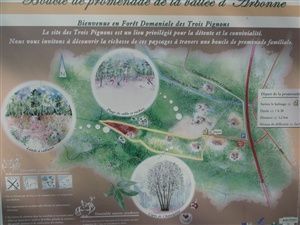 Leaving the Barbizon centre can be reached in the forest of Fontainebleau (see map), one of the hikes you can perform is called the trail of the rider of the brigands. 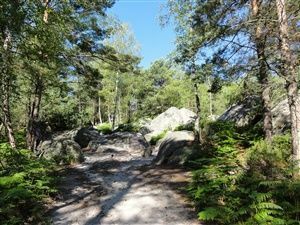 The start is located next to the restaurants, then just stay focused (very) to follow the signs among the rocks. The cave of the brigands, which is not well marked, is an extremely narrow passage under a rock pile. If you're not claustrophobic and if it weighs less than 40 kg we can apparently go through a tunnel. You can see the entry in the photo. 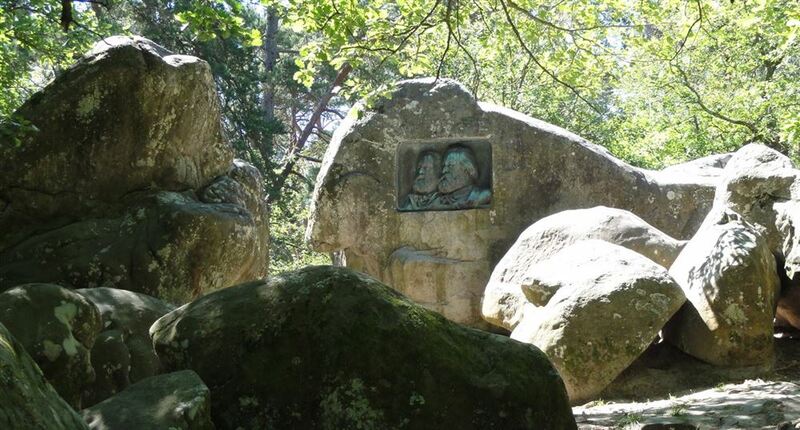 The cave of the Brigands seems never been frequented by thieves is an organizer of tours in the forest that had him dig in 1850 to attract tourists. Considering the world he has pulled it off. 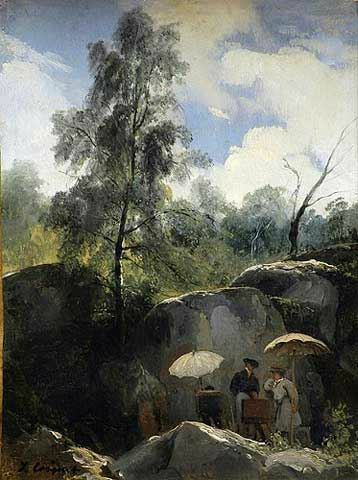 Jules Coignet, painters on the ground in the forest of Fontainebleau, oil (Barbizon Museum). 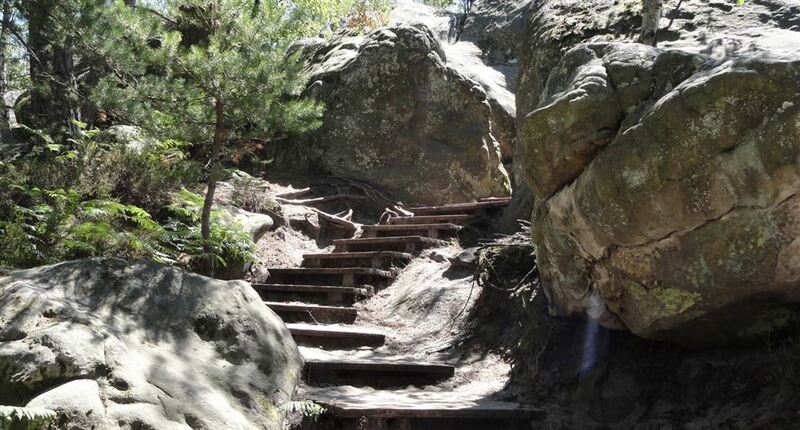 It is difficult to locate some of the works on their original locations, because the forest has changed a lot. 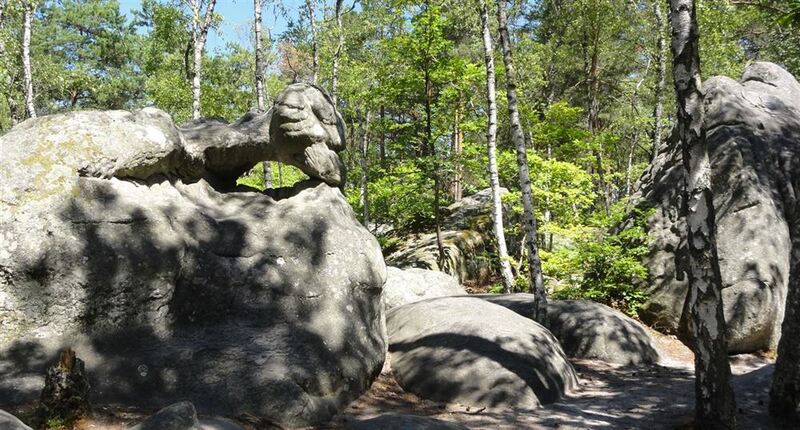 One of the examples of painting in the forest of Fontainebleau. Corot, forest of Fontainebleau, 1830. 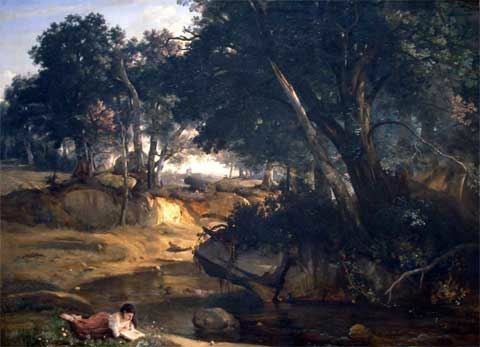 COROT is one of the first artists to settle in Barbizon. The Jean-François Millet angelus, his best-known work. The angelus is exposed to the Musée d'Orsay in Paris. The table represents a man and a woman who stop work on hearing the bells and who begin to pray. The painting shows the style of painting at Barbizon. You can access to the gorges of apremont from Barbizon. Just to park here out of Barbizon and follow the signs to find the departures of hiking.